It would seem that I am making the wrong choices when setting priorities these days. I’m used to my work priorities changing, but not my quilting ones, probably because I don’t usually have priorities and deadlines for quilting and I try to keep it that way. My motivation for posting my priority in March was to encourage myself to write in my blog about it – but I may have forgotten that I needed to actually finish the quilting that I set as an objective! Quilting almost every day is not an issue for me, but what I’m actually working on seems to be. Oh well, live and learn. I am happy to report that I finished my Guild Music Challenge quilt. I worked on it at the beginning of the month, but typically left the embellishment till the last minute. I was intimidated by the FMQ of the “world” part of the quilt because I wasn't sure how that would go. Turns out it was great. I started by stitching in-the-ditch, which wasn't technically “in-the-ditch” because of the embroidery located around each piece. I then did some FMQ of the different fabrics. I had a ball. It was so hard to stop! I was also unsure of how to FMQ the background because I wanted the people holding hands to stand out. I started by echoing the top of the people. After that, I FMQ clouds in the sky. I looked all over the internet for inspiration and finally ended up using a variation of Angela Walter’s work that she had done for a client. 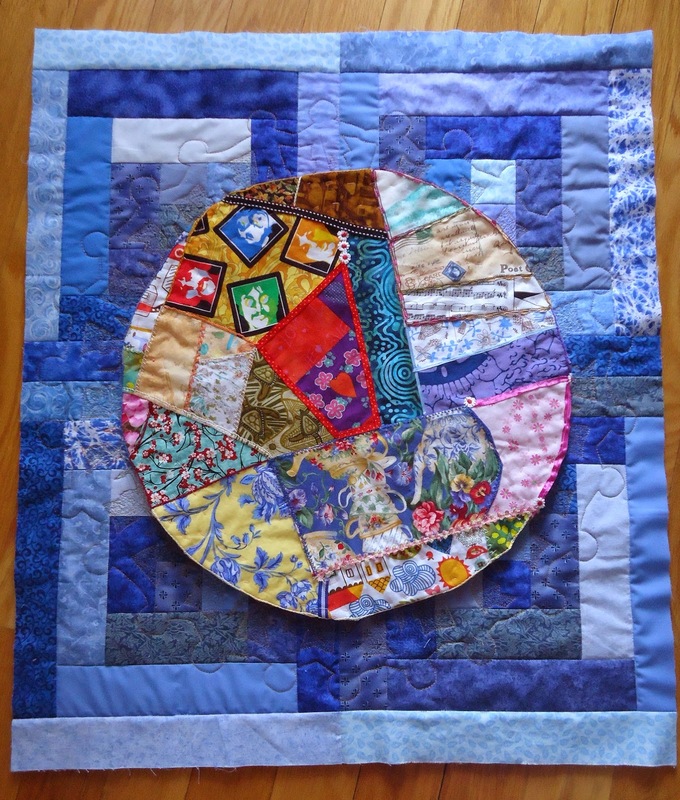 When I attached the world and the background together, I just quilted in-the-ditch and quilted around the outside edge to make sure that both pieces stayed together. If I was fussier, I would have re-done the embroidery around some of the pieces of the world, as well as some located on the outside edge of the world. On the other hand, there’s nothing stopping me from re-doing these at any time, if it does bother me. I am truly not a perfectionnist! I’m ambivalent about the end project. I like it, but I think that the finished project in my mind might have been better than the real thing. I did learn a lot throughout this project. I really enjoyed the embroidery as well as the embellishment with beads. I could have kept going, but for the amount of time it would have taken, I’m not sure that it would have added anything more to it. You have to stop sometime. I loved the FMQ of both the world and the background. In the end, I think that adding an echo around the people holding hands was a good idea. I don’t really think that it needs to stand out more. I have to learn that subtle is good too! 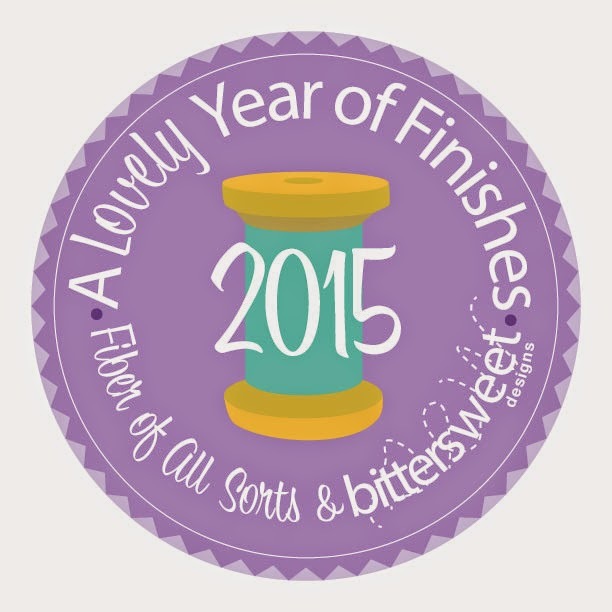 Check out other participants in the March 2015: Lovely Year of Finishes, Free Motion Mavericks and Fabric Tuesday by Quilt Story. A long weekend of quilting was just what I needed to recharge my batteries. I hadn't participated in any quilting retreats since last spring. I was overdue. I love quilting at home but sometimes it's great to be sociable; see what others are making; and of course, learn and try new things. The night before the retreat, I was planning what to bring. I had energy since I was taking the next day, a Friday, off. 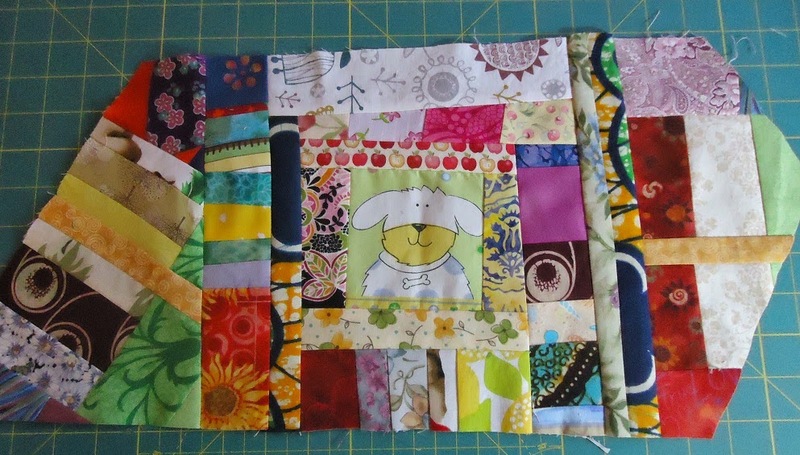 I tried to make a new block for my garden exchange - it was a dud. I made a stand from fabric and cardboard for my IPod Touch - it turned out ok, but I managed to get the measurements wrong. No big deal, but a sure sign that I was tired. Very tired. So Friday I went to the retreat with at least 5 projects to work on. When I got there, I knew that if I did anything that required concentration, that it would be a disaster - so I took out my box of scraps. Turns out I didn't even have the energy to trim them. Not a good sign. So what did I do? I started sewing the scraps together. Any old way - it didn't matter, as long as I was sewing. After an hour of this, I decided to do the social thing and go see what my friends were doing. Quite a few of the quilters were making this very cool quilt called Toes in the Sand. 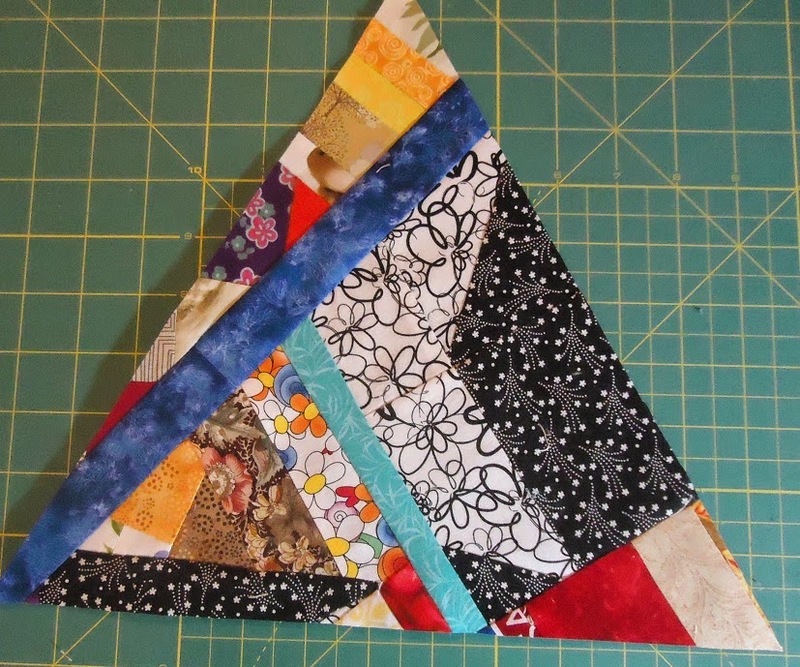 It's a quilt of wonderfully pieced triangles set between solid triangles. Very intricate and very, very lovely. I wanted to make one - but that wasn't going to happen that weekend, until it hit me that I could make my triangles out of scraps. 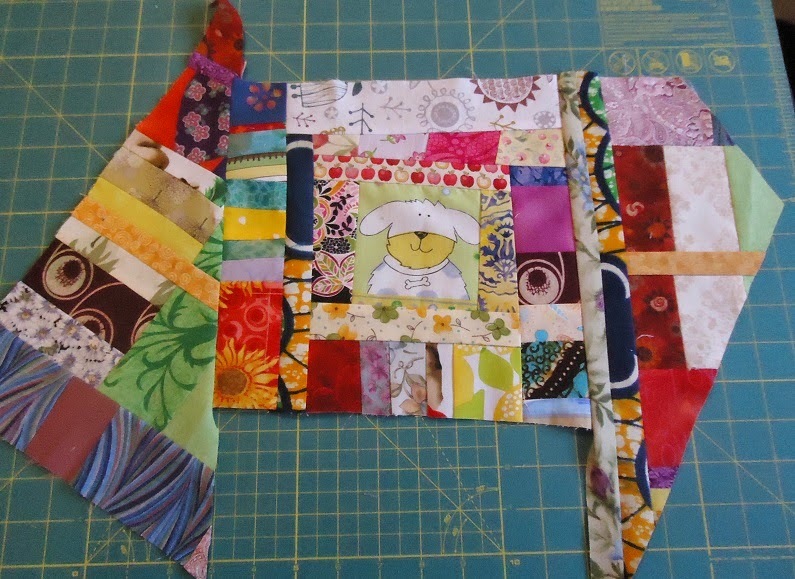 No measuring, no fussing with seams, just sewing tons of scraps together and then cutting the pieces into triangles! When I got home on Sunday afternoon, I had 18 triangles completed. I even made a couple more Sunday evening! 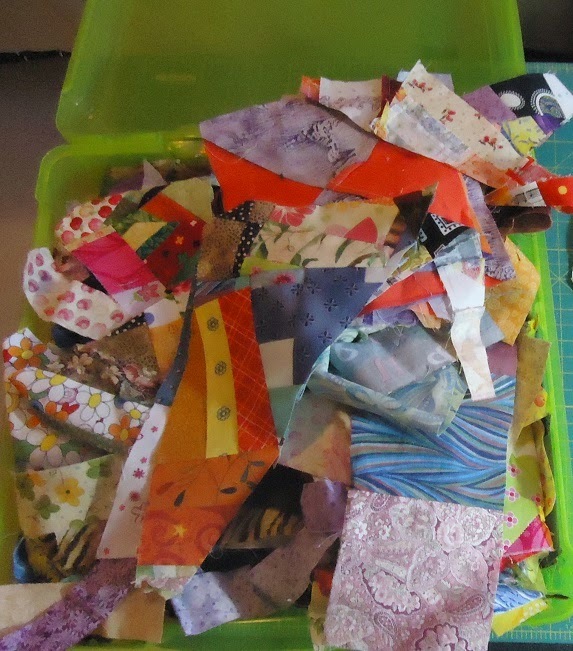 Tonight I got back into my scrap box since I need 24 scrappy triangles for the quilt. I don't usually write about my process (mostly because I keep forgetting to take pictures!) so this time I made an effort. 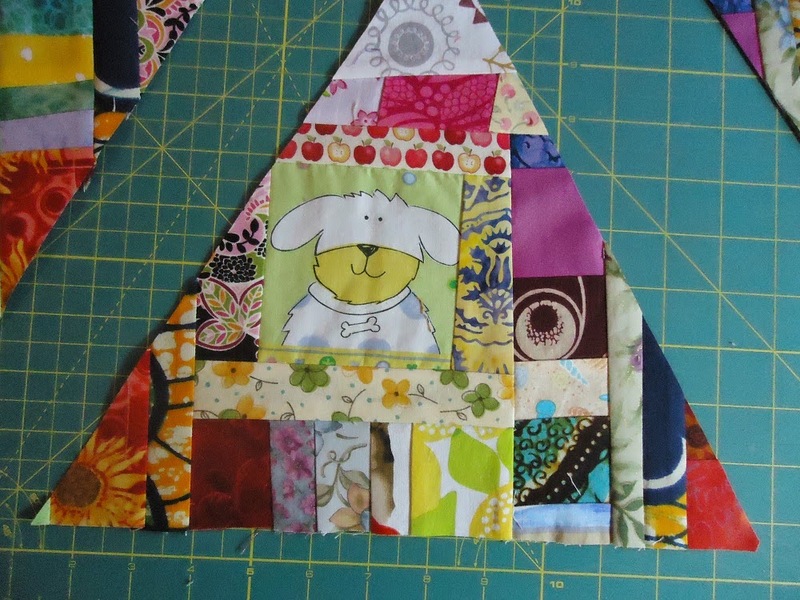 Once I have a block that is big enough for my triangle template, I cut out the triangle. 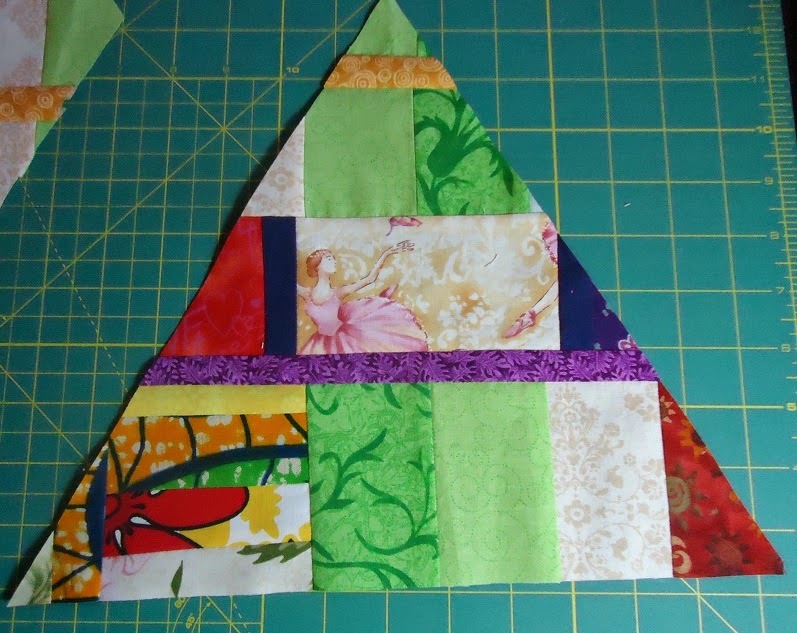 To make another triangle, I can attach the leftover fabric to a new piece. I trim the sides to make it easier to add more fabric, and keep going until the piece is large enough. I keep going like this, either adding leftover pieces to new blocks or just starting new blocks. Old blocks that never quite made it into a project can also be used to build up the scrappy piece. 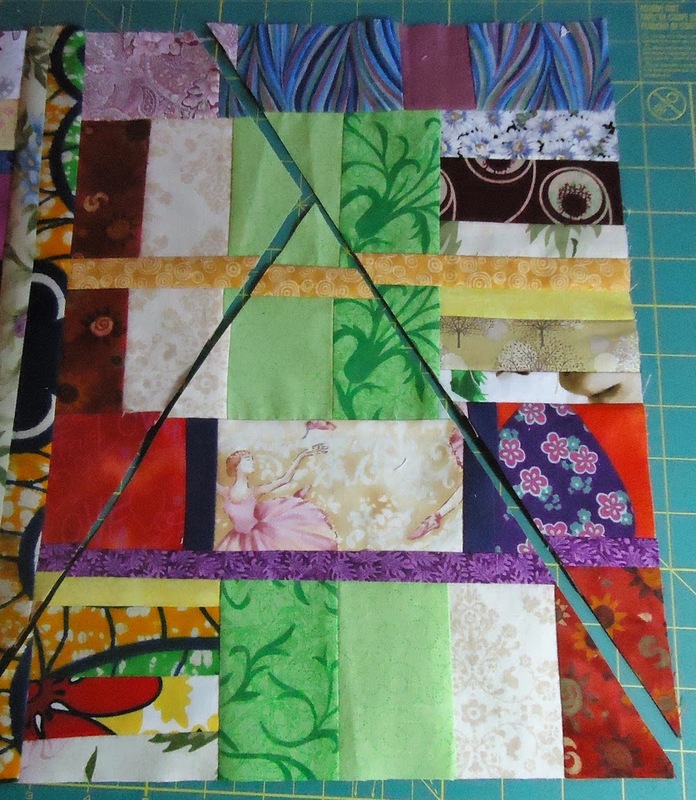 In this instance, this block was for my Beginner's quilt-along. I was using monochromatic colours within each block. I thought that black and white might look good, but they were definitely not monochromatic! Since the points on the block are pretty rough, I really didn't mind cutting it up for this project. Here is the resulting triangle. Not following any rules, not measuring and just playing with fabric is very therapeutic. Although there are no rules, there are some best practices! The first one is to iron - a lot! I made some of my triangles around a focal point, but tried not to make too many of these. I have often played with my scraps when I want to sew but don't know what to do. When I started making these triangles, I had all kinds of partially sewn pieces that I could put together. When you think a piece is doing well, cut it up and place a thin strip of fabric between the two pieces. It's also fun to invert the pieces when you put them back together. The resulting triangle is often a surprise. Since I used a paper template, I'm never sure what my triangle will look like until it's been cut. I now have 22 triangles and have chosen my background fabric. The next part of this project will be more structured. It'll be back to following the rules - just like going back to work after a vacation! I've linked up to Fabric Tuesday and Link-a-Finish Friday (the quilt isn't finished but most of the triangles are!). Check out our fellow quilters! 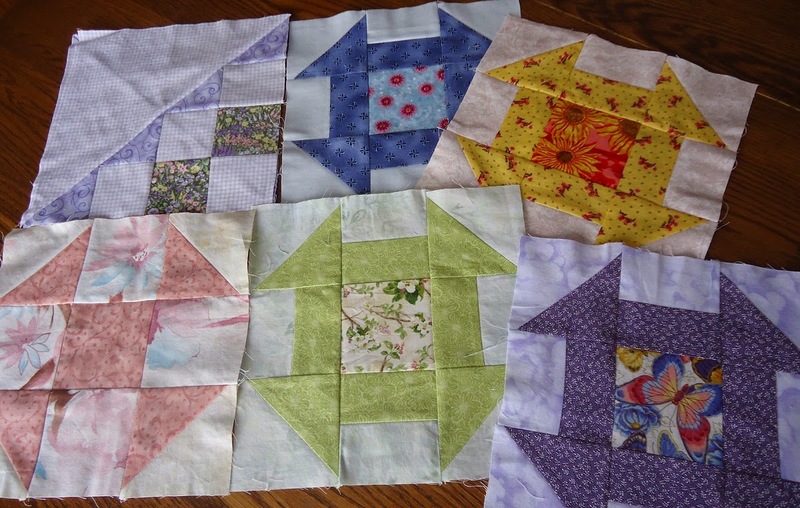 I once blogged that there might be such as thing as too much of a good thing - that is, free-motion quilting (FMQ). Now I'm not so sure. Since I've gotten better at it, it's become incredibly addictive. I'm not sure that I'll ever be able to just stitch-in-the-ditch or do some minimalist quilting. It doesn't mean that every inch of every quilt needs to be quilted. It still depends on the quilt; its design, use, etc. I'm just saying that it's really, really difficult to not keep going when you're FMQ. I can safely thank (or blame) Cindy Needham. I have taken both of her Craftsy courses and have watched them both a number of times. 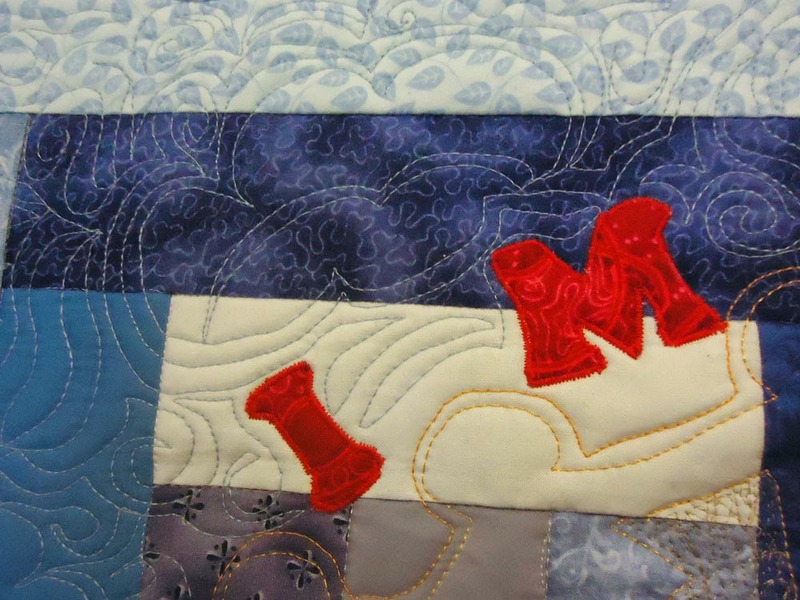 Design It, Quilt It: Free-Form Techniques has some great tips on FMQ. The one that got me though, is Machine Quilting Wholecloth Quilts. This course is about creating Wholecloth quilts (basically from one piece of fabric as opposed to a pieced top). 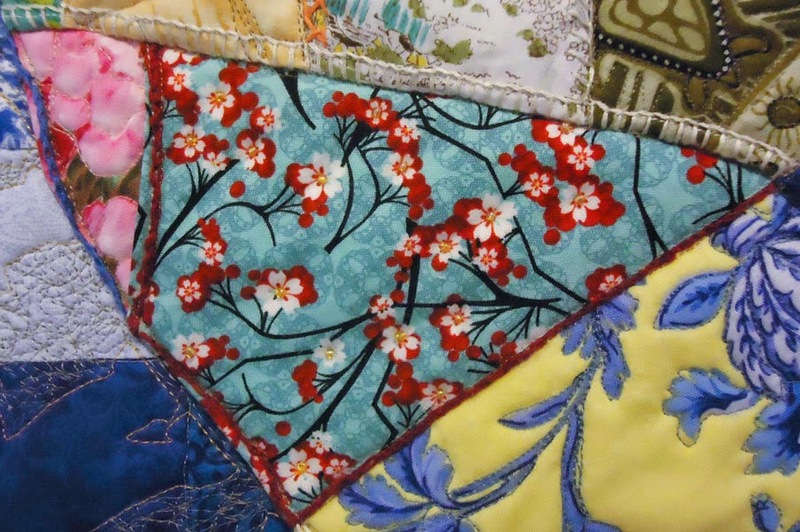 Since most of the quilts are just one colour, which means ample opportunities to FMQ. 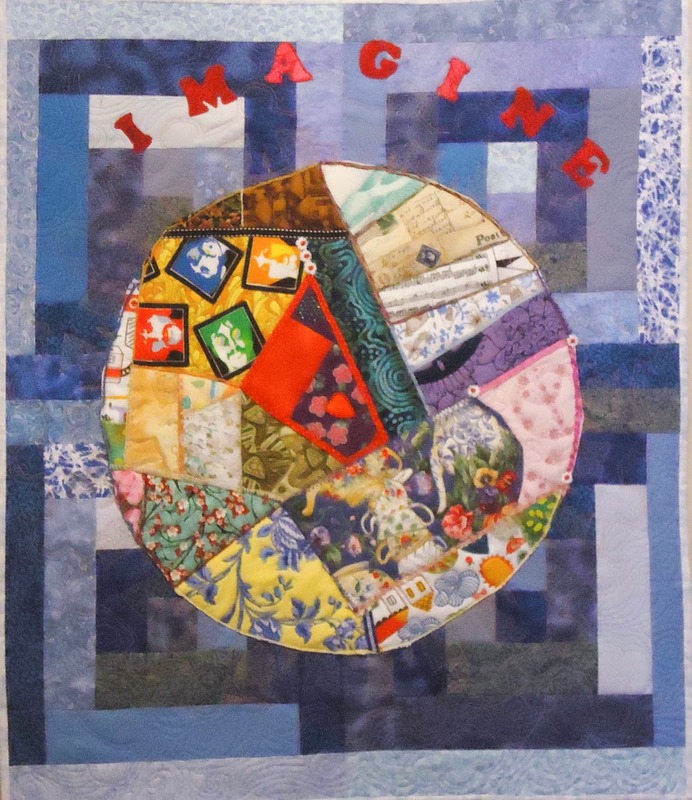 Her incredible quilts are usually made of vintage linens over plain cotton or silk fabric. Cindy clearly loves her vintage linens and incorporates them on wholecloth quilts while highlighting the original creator's work. This is all beautiful and truthfully, a little intimidating. So, instead of starting with a wholecloth quilt made of linen, I've started with a project that was less intimidating but that let me FMQ like crazy. It's creating a wholecloth quilt from large print fabric. 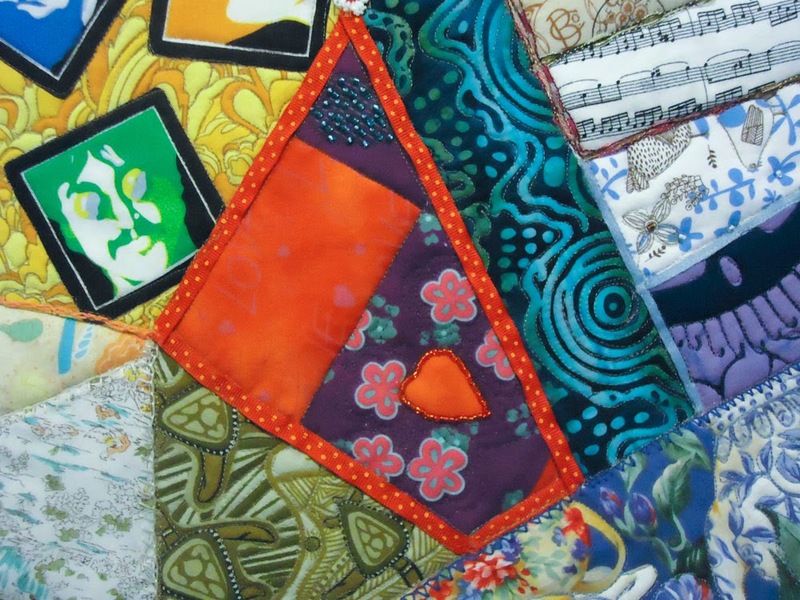 You use a fabric that has interesting shapes that would be fun to quilt, and you quilt it from the back. Let me explain. Here's the fabric that I chose. It's got all kinds of interesting shapes that would be fun to quilt. I created a quilt sandwich with some lovely light yellow-orange fabric. I chose a couple of threads that would go well with the fabric. 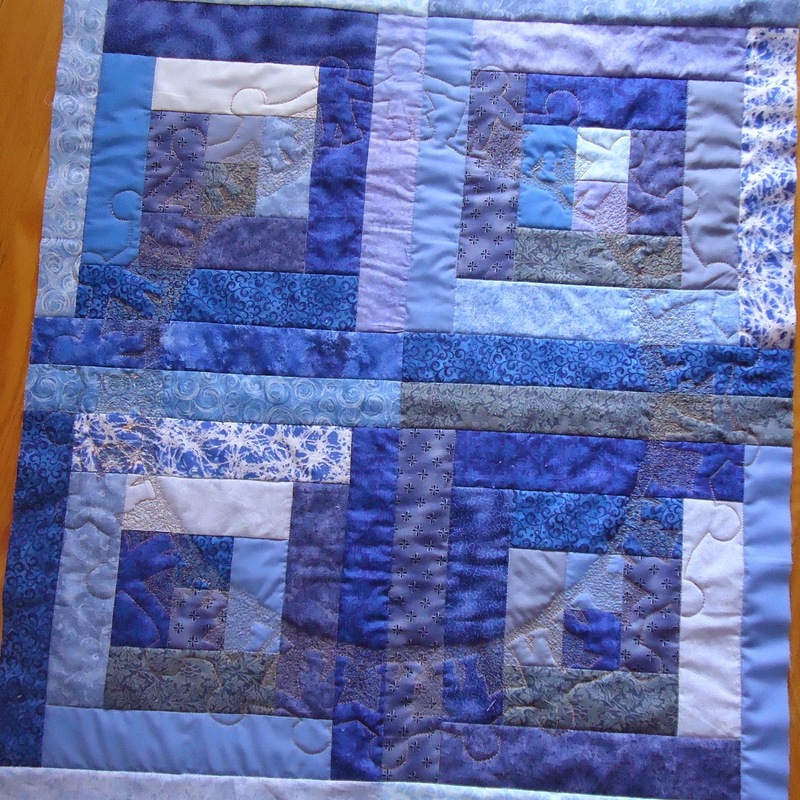 I used a thicker thread to outline the shapes while the other finer thread was used for the scribbling and other FMQ shapes such as pebbles, straight lines, S-curves and feathers. All of the quilting is done on the front of the large print fabric. The beauty comes when you look at the other side! 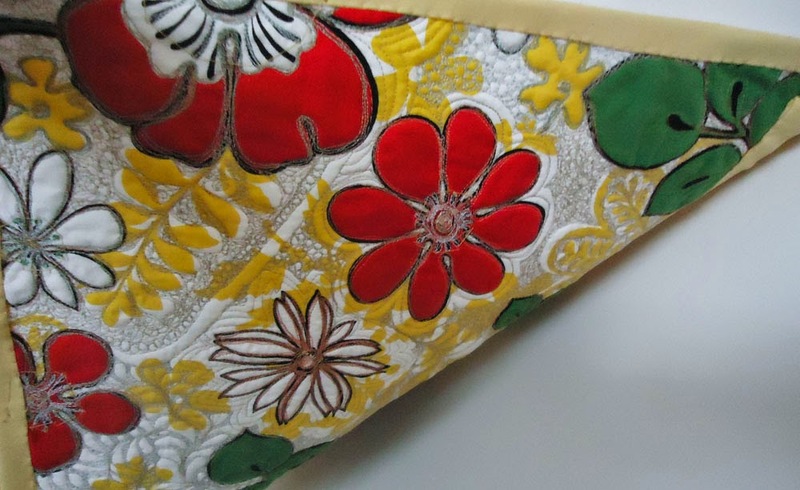 Isn't it amazing that quilting that rather gaudy fabric could create a piece of such simplicity and elegance? 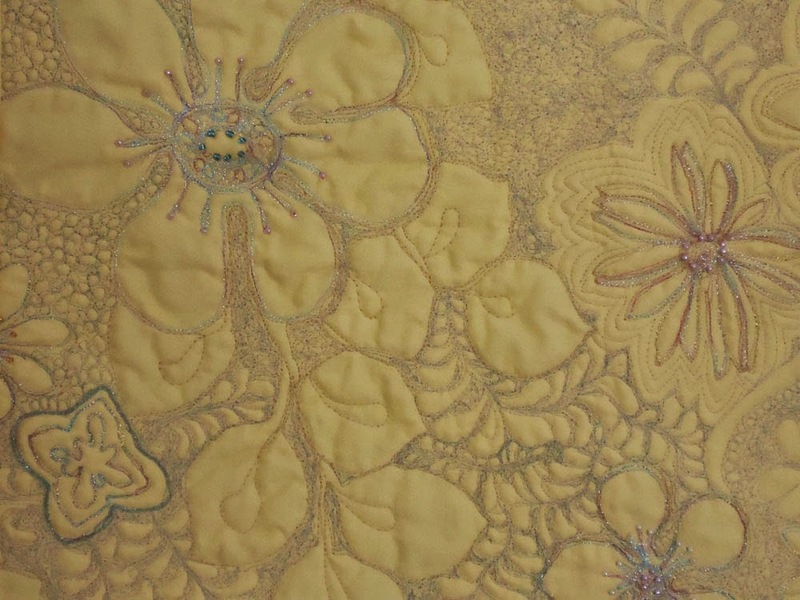 This technique is perfect for quilting with metallic threads. These can be very finicky to quilt with unless they are in the bobbin. 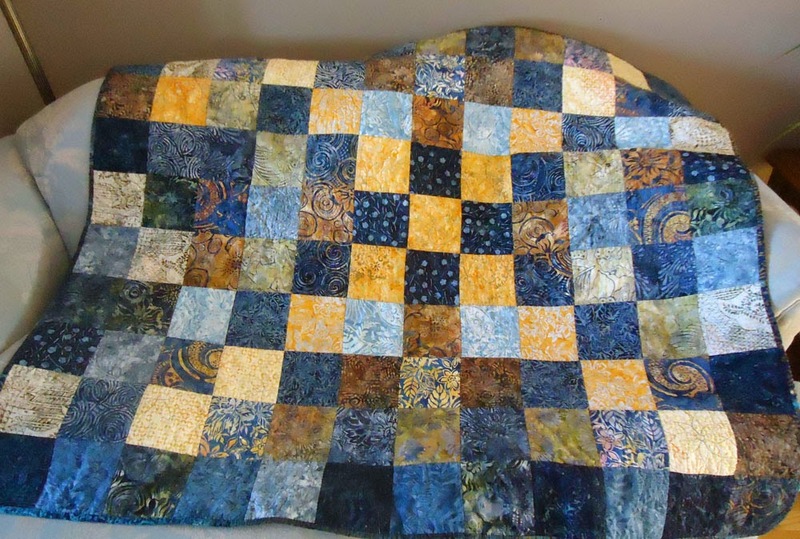 Since this project is quilted from the back, it highlights all of the bobbin thread. 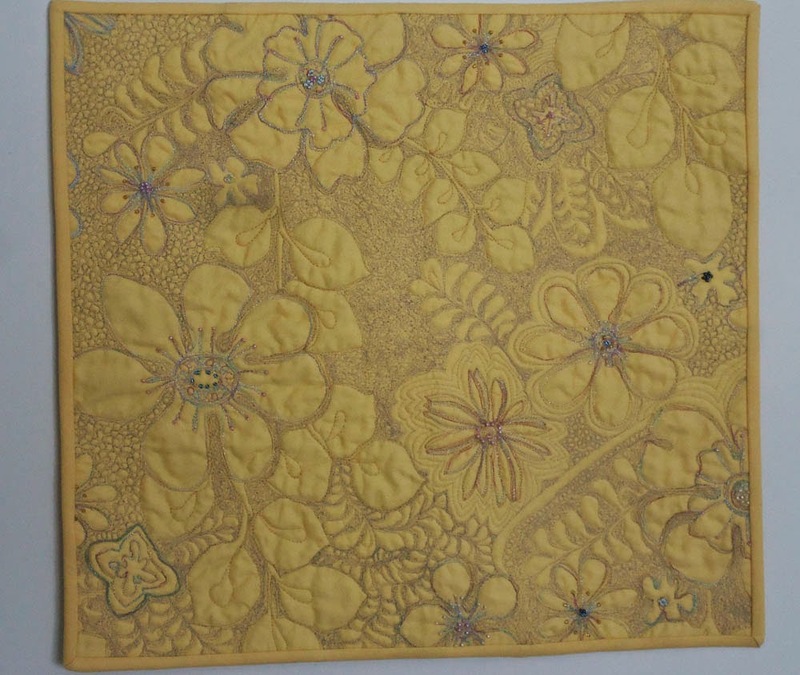 As you can see from the photo, the flowers were quilted with the metallic thread, sometimes 3 or 4 times so that they will show up. Here are images of some of the details. 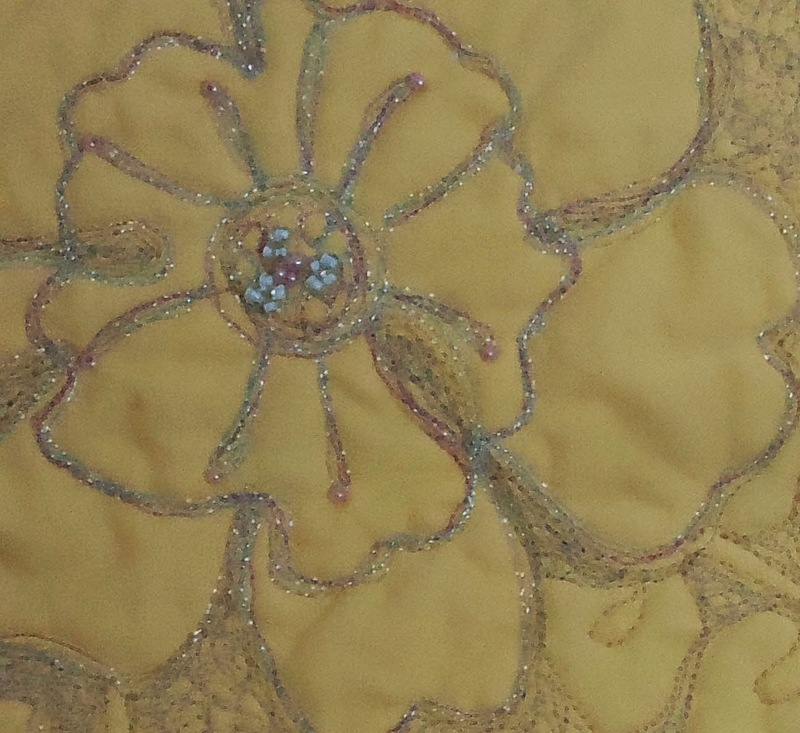 The metallic thread and the beading add an elegant touch. You can see the scribbling, pebbles and feathers between the outlines of the flowers and leaves. Quilting from the back of the quilt took some getting used to but what an end-product! I couldn't wait to take it out to see the results. I've since tried to work with metallic thread that was not in the bobbin. What a mess! This was a great project to practice FMQ. There was TONS of FMQ and you can't tell from the end product if you followed the lines or not! I suspect there will be a few more of these wholecloth large print wall hangings since they were sooooo much fun to work with. I may be ready to work with some linens. I'll start with hankies that I picked up in China. At least if doesn't turn out as well as I'd like, I won't have destroyed a vintage piece! I linked up to Free Motion Mavericks. Have a look! To encourage me to keep blogging (I don't need encouragement to quilt! ), I've decided to write about a few challenges that I'm participating in. I was hoping to participate earlier this year but as you can see, it didn't happen. My goal for March is to complete my Music Challenge quilt for our Guild. Since the deadline is our April meeting, getting it completed before March 31 would be perfect. When we joined the challenge, we were given a fat quarter of music fabric. It has to be incorporated into the quilt (as little or as much as we want). 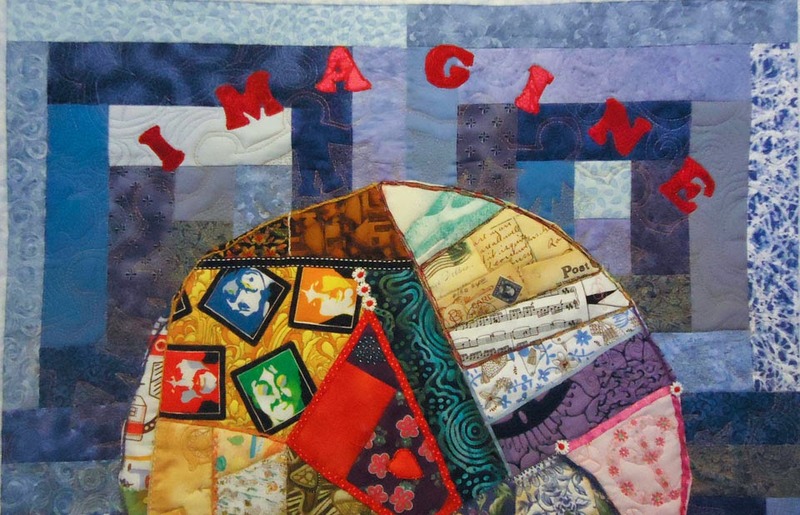 The quilt should illustrate or be inspired by a piece of music. It took me a while to decide, but I finally picked "Imagine" by John Lennon. 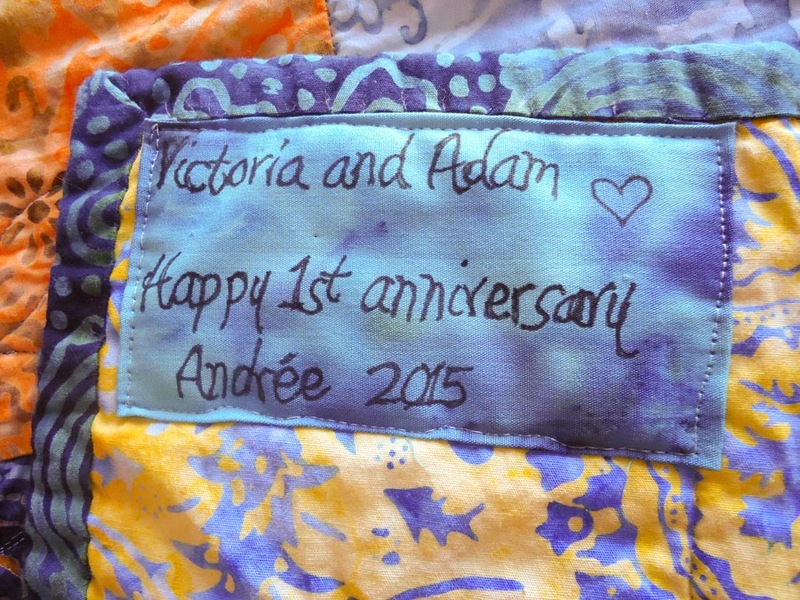 It all started with a quilting pattern of people holding hands - what could be better? To make this interesting, I decided to make a 3D quilt. 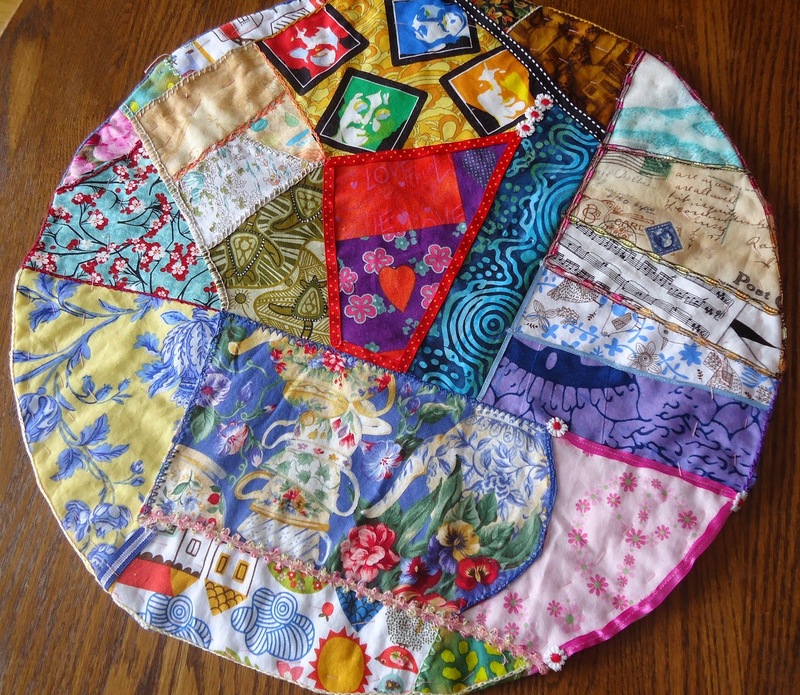 The centre is the world, made from fabrics that represent various cultures and nations, pieced crazy quilt style. I've completed the piecing of the world and have embroidered and embellished it with ribbons etc. I haven't added beads yet since I need to FMQ it first. I'm still not sure how I want to do this yet. I guess I have a couple of weeks to figure it out. 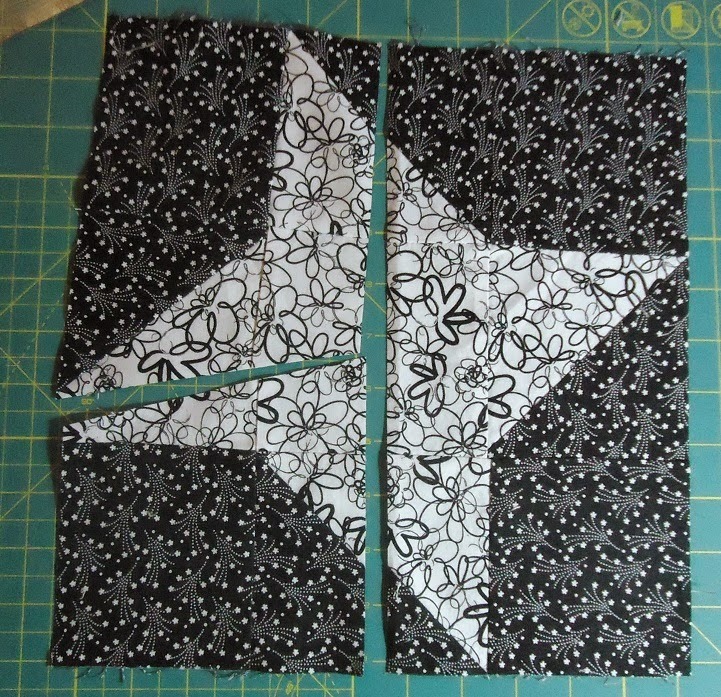 I've completed the pieced background and have started FMQ it. I want the "people holding hands" to be the focal point of that section, so I'm still trying to figure out how to finish FMQ it. After that, I will have to attach both pieces together. I'm really happy that I took the time to write about this project because the pictures I took have shown me that I have a lot of work to do to get those "people holding hands" to show up. I think that the deadline for the challenge is our May meeting. At this time, two of these projects have a fair chance of getting completed; the South-West art quilt and the Snippet flowers in a vase (if I can find it!). I've included this block exchange as a challenge - cause it is! Having to make 23 blocks by a specific date is definitely a challenge for me. I am making an assortment of blocks since I don't have the patience to make 23 of the same blocks. It turns out that there aren't that many patterns for 9" x 9" blocks, but I finally figured out that they are essentially variations on 9 patch blocks, so I can either expand a 6" block, or reduce a 12" block. That will give me many more options. I'm not very good in math, so I use grid paper to calculate the sizes. Gotta love grid paper! Here are a few of my blocks. I have 10 blocks completed. Only 13 left to finish before June! Very do-able. Here are two projects that I completed. This quilt was begun over a year ago at a quilting retreat. I don’t often use pre-cut fabric but had gotten these two packages of batik Mini-blueberry Pie Charm Squares by Timeless at a really good price. The colours turned out to be absolutely stunning. At the time, I was just starting FMQ, so the finished top sat around until I was confident enough to quilt it. I finally quilted it this fall using a lovely stencil. 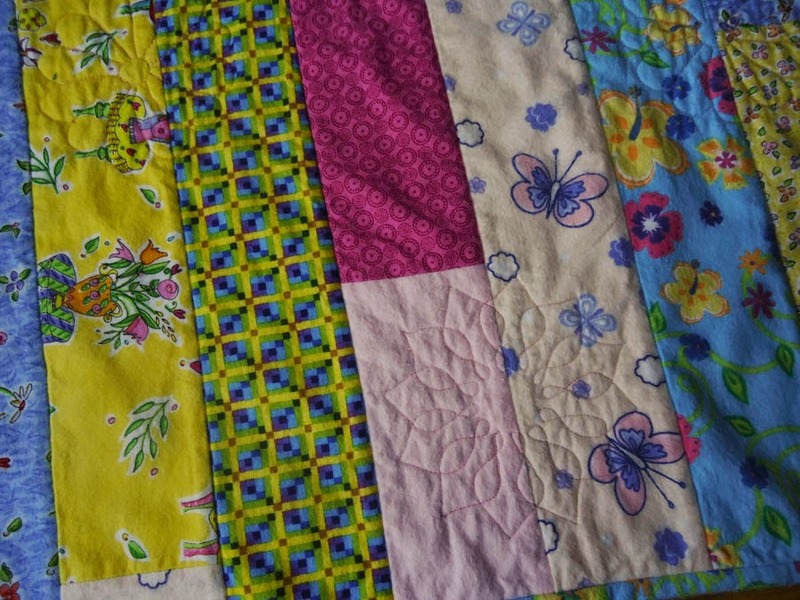 Since the colours are very busy, the quilting shows up well only when looked at up close. I used a lovely shiny blue Madeira polyester thread (Polyneon No. 40). I really like the way it came out. When purchasing this type of pre-cut packages, there will probably not be any left-over fabric for the binding (oops!). Luckily, Jan, the owner of The Pickle Dish in Carleton Place was coming to our guild meeting, so I sent her a picture of the quilt and she brought me three beautiful fabrics to choose from. My quilts get quilted when I’m ready. Trying to hurry things is asking for trouble. I can’t remember where I read about this technique for making a label but the person used a nice font, printed the message and then used a light box to copy the message onto fabric. I think that it turned out well. 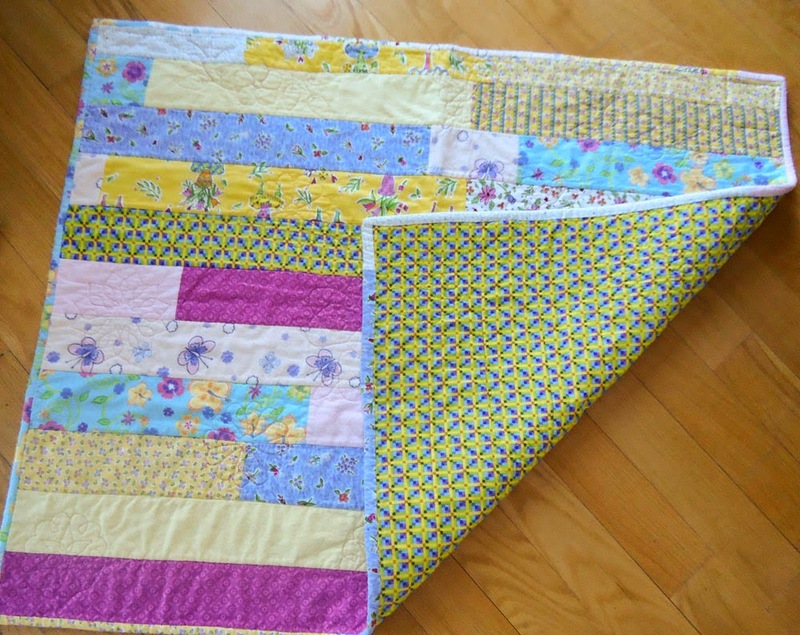 The other completed project is a baby quilt. It was a Quilt-as-you-go (QAYG) technique that I found on a blog, made by ChrissieD. It’s a QAYG Wholecloth Stripy Quilt. The idea is to use one wholecloth fabric for the front of the quilt, while quilting strips together on the back of the quilt. It’s a great idea, but I didn't really have a fabric that I wanted to use for a quilt top – so I just reversed the concept. I had a lot of fun putting all of these pretty flannel strips together. In theory, a QAYG quilt is pretty much completed when it’s all pieced, but there was no way I could just leave it quilted with only straight lines. I used some stencils to guide my free-motion quilting (FMQ). Some of the quilting doesn't really show much because of the busyness of the fabric, but it just had to be done! Here’s one of the flowers that showed up as well as a sun. I used flannel for both the front and back of the quilt, as well as a light batting. Personally I think that it’s too thick. Next time I will either not use a batting or use a cotton on one side. I would love to create a real wholecloth quilt with this technique. 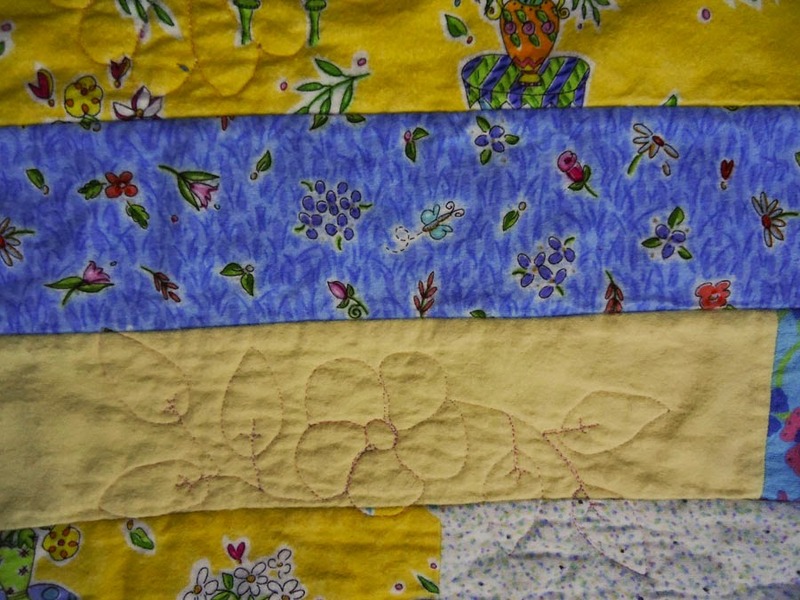 Check out ChrissieD’s website to see her stunning quilt. This post is linked to Needle & Thread Thursday, Link-a-Finish Friday, Keep It Simple Make It Fun (KISMIF) and Can I get a Whoop Whoop?. Just posted on Free Motion Mavericks. Check out the fun!